slakingfool: Top off the morning with a Topped Doughnut! Top off the morning with a Topped Doughnut! Once upon a time there was a hard-working single mother from Ankeny who decided to treat her co-workers with some doughnuts. Oh, but these were no ordinary doughnuts, especially the one I was fortunate enough to sample. 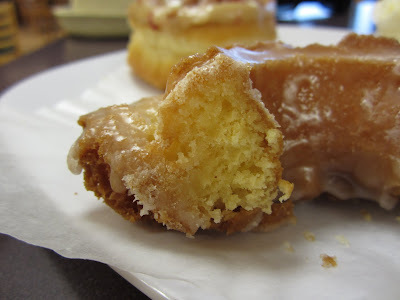 And with memories of that delightful nosh, I took an opportunity early one Friday away from work to grab an outgoing DART shuttle bus to Ankeny for a visit to the source – Topped Doughnuts. Topped Doughnuts shares space with CJ's Bagel Basket, just a stone's throw north of Ankeny's economic crossroads at the intersection of Ankeny and First. 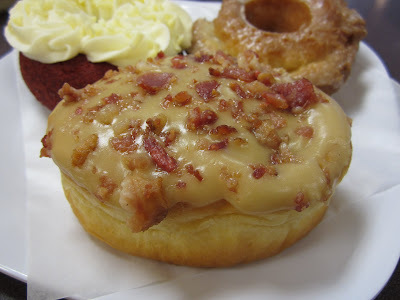 Started in September of 2010, Topped Doughnuts has quickly become a Metro favorite despite its out-of-the-way location. 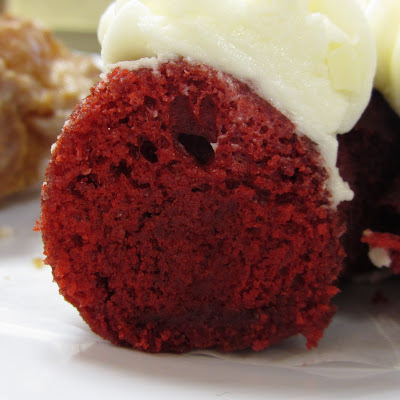 Popular enough that Crème Cupcake will offer a selection of Topped Doughnuts' namesake product when it moves into the old Great Harvest Bread bakery off Ingersoll on 28th this summer. Having just beaten a rainstorm bearing down on my walk over from the nearest bus stop, I hungrily surveyed the days' flavors. 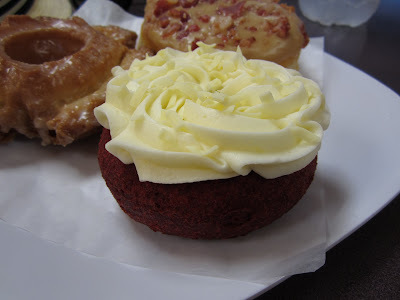 First up a revisit of the doughnut that had enraptured me so many months ago, the Red Velvet. Truly the ambrosia of deep fried cake doughnuts. Crisp exterior, moist cake, topped with an indescribably delicious cream cheese icing. And I usually loathe icing. With a sprinkle of white chocolate shavings to finish, this is THE doughnut to get. Don't call it a Red Waldorf or I'll smack you! 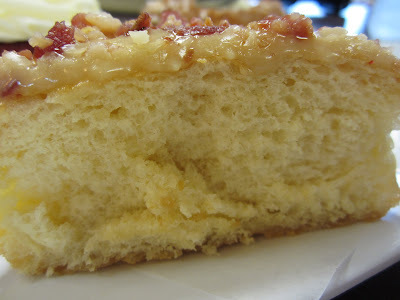 The Maple Bacon sports a maple icing with crumbled bacon atop. A tad more bacon would help offset the strong, sweet maple flavor. The yeast raised doughnut is light and airy, but with structure. Bonus points for the crisp exterior. I'd eat this sans frosting, but I'm weird. 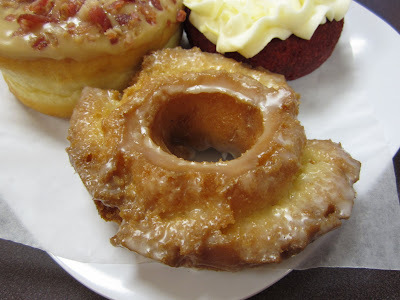 The slightly tangy sour cream Old Fashioned doughnut enrobed in a vanilla glaze is visually different than your average cake doughnut, reminding me of a sausage ring with its casing split. Tender crumb, crisp on the outside, with all sorts of appealing nooks and crannies. The final bite capped off my overindulgent visit rather well.